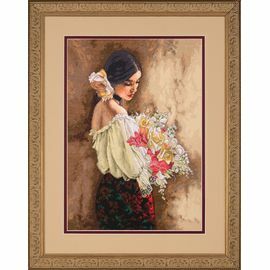 It is a lovely design of a beautiful woman with a large white rose in her hair, holding a bouquet of white and pink flowers. She's wearing a white blouse and a skirt imprinted with red flowers on a black background. Perfect for any fan of classic beauty or floral designs! Kit contains: presorted cotton thread, 18 count beige cotton Aida, needle and easy instructions. 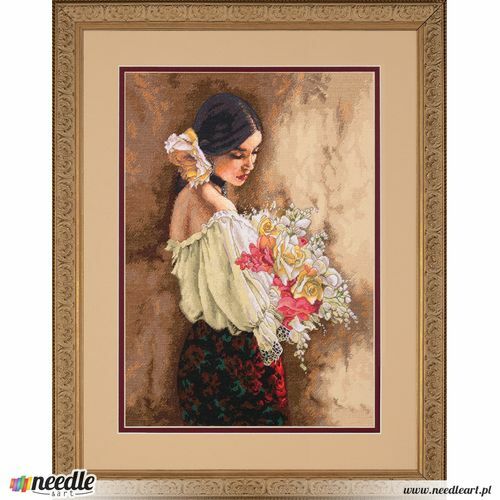 Fabric size: 15 in x 19 in.